Gather round, triathletes, and let me tell you a tale of the little tri club that could. 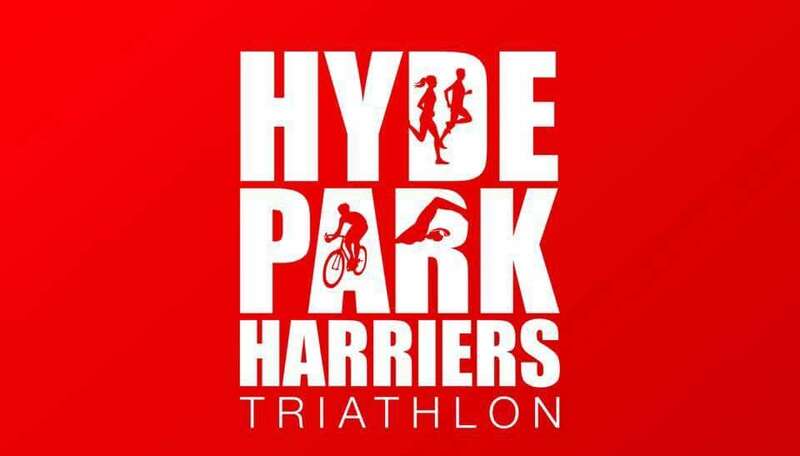 Who’d have thought that moving the ITU triathlon from Hyde Park (the London one) would have caused the formation of HPH Triathlon?! And a few weeks ago, we had one of the busiest non-ITU weekends in a while. With triathletes doing a range of distances at the Sundowner, battling on the heights of Helvellyn, spinning around Selby on the Three Swans Sportive, and your resident writer running around down south, I thought it would be a good idea to put together a semi-regular roundup of how everyone is getting on. It’s a chance to share you successes, get some top triathlon tips, and find out what’s happening with your fellow club-mates. It can only work with your submissions, so if you have a race or something you want to share, send me a message on Facebook or email tom.pollard5@gmail.com, and I’ll make sure it gets published! We had a great turnout across both days, with seven superstars making it the startline for the sprint (including two rocking rookies) and two heroes going for the middle distance version. Ralph and Naomi bring your their reports. 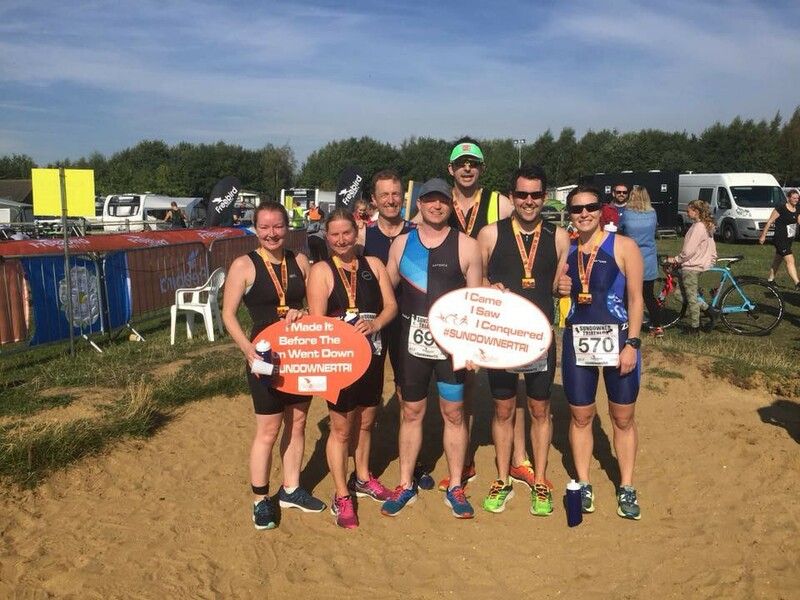 The race consisted of; a 700m horse shoe lap around the lake, followed by a flat 20K bike route through the rural villages of Allerthorpe and finishing with an out and back 5K run. Naomi took full advantage of her mermaid tail and was the first HPH to emerge from the lake, shortly followed by Davyd and Leigh, and so the battle to be first HPH home began. Greg and Graeme were in hot pursuit as they headed out of T1 onto the bike leg. 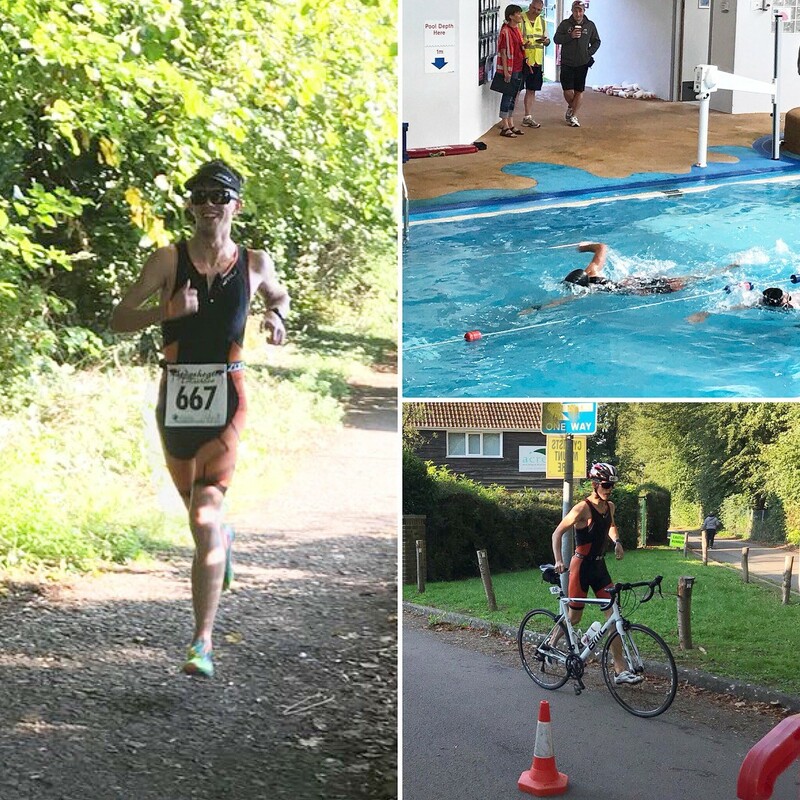 In contrast Roz, who was completing her first triathlon after officially joining the club only 3 days before, used T1 for a full wardrobe change, taking an incredible 5 min 31 seconds to complete transition! (Discipline position: 311/314). This provided seasoned triathlete Ruth the perfect opportunity to catch up as the pair chased each other around the bike leg. After a cracking ride, Greg found himself in pole position as he headed out on the run. He didn’t dare look behind him focusing on the road ahead. As he ran round the halfway cone he got a glimpse of the danger approaching, Naomi was less than 20 seconds behind and chasing him down, even more alarmingly the Chairman himself (Graeme), known for his sprint finish was rapidly catching up with them both. Greg ran a huge 2 min 5k PB and managed to hold off the competition to claim first HPH triathlete home in 1:12:49. Naomi Kellett was only 6 seconds behind in 1:12:55 (2nd in age category) followed closely by Graeme Miles in 1:13: 18 (3rd in age category), Leigh Schelvis in 1:19:39 (5th in age category), first timer Davyd Chalker in 1:21:41, first timer Roz Smith 1:30:28 and Ruth Watson in 1:35:44 . It was a great event and fantastic to have so many HPH Triathlon members competing. 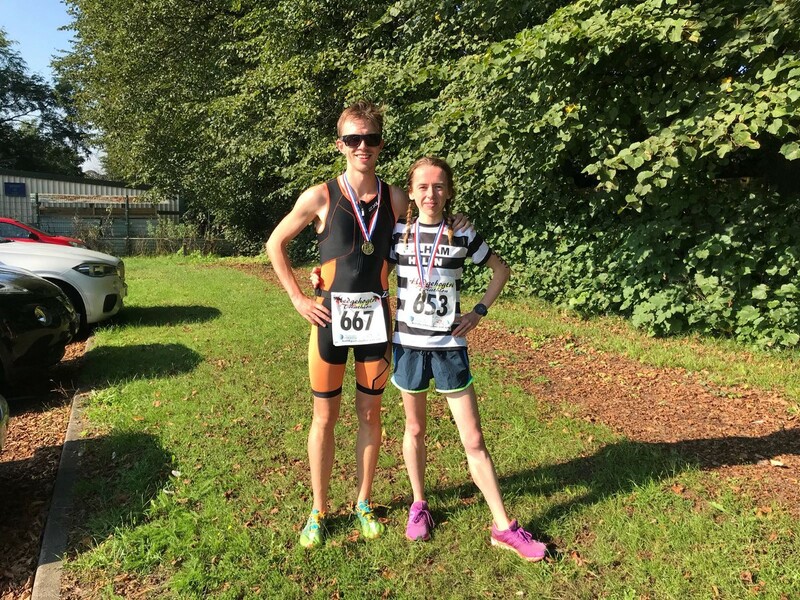 A massive well done to Davyd and Roz on completing their first Triathlon. Time to get some winter training in ready for next season’s competition. P.s. For those who are interested the standings are currently 4:4. This was my big goal for the year, my first half iron distance triathlon, aka “middle distance”, aka “70.3” — 1900m swim (1.2 miles), 90k bike (56 miles), 21k run (13.1 miles). I chose Allerthorpe because it’s a flat bike and run course, on (mostly) quiet picturesque country roads. It’s relatively local, only 40 miles from where I live in Leeds. It’s spectator and supporter friendly — good cafe on site, pleasant surroundings, and the lapped swim bike and run routes mean plenty of opportunities for monitoring how things are going and saying hi. The event doesn’t start till midday, so it didn’t require a crazy early morning wakeup alarm. The weather for this year’s event was great; maybe a bit hot and a bit windy, but I was very glad it wasn’t torrential rain like they had for the event a couple of years ago. My target was to finish in under 7 hours. I managed it in 6:46:42, so I was very happy with that. My swim went pretty much as expected, 54 minutes in the water. (Yes, I know that’s really slow, but I’m still just breaststroking all the way!) It was 3 laps of the lake, including a sort of v-shaped section on each lap to make it up to the required distance. You were in the water for the start of lap 1. At the end of laps 1 and 2, there was an “Australian Exit”, so you came out of the water, went along a bit of blue carpet then waded back in to start the next lap. 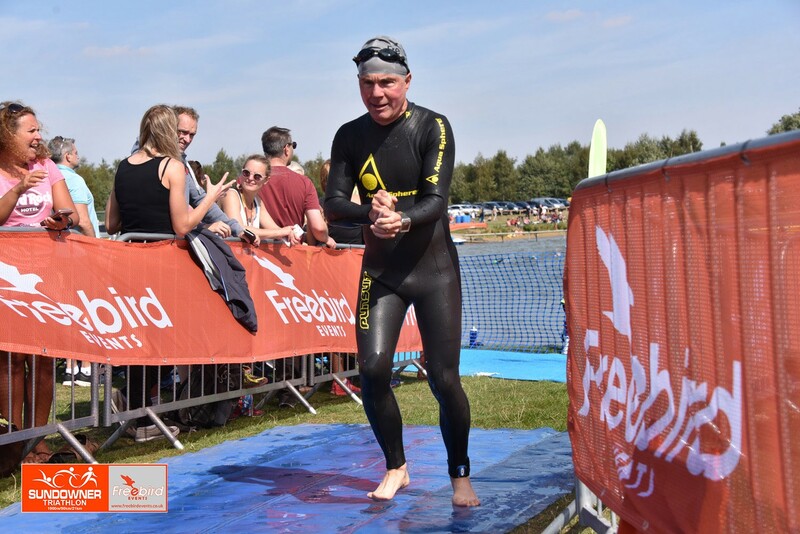 One of the great things about the Allerthorpe lake is it’s shallow and there are several places around the edge where you can stand up if you need to, which was very helpful for me when I found out after I’d started that my goggles were leaking and I needed to adjust them. One not-so-good thing about the course was that very shortly after the start you had to swim between a jetty and a big blow-up play park, which was a narrow pinch point. It didn’t really bother me because I was a slower swimmer at the back of the bunch, but I heard several people comment that they’d taken a clattering getting through there. There were 6 swim start waves altogether and one thing I liked about this event was that the slower people (i.e. including me!) got to set off first, whereas in most other events it’s usually the other way around. So I did get to see more people, out on the bike course in particular, even if they were people cruising past me on their fancy disk-wheeled TT bikes! My bike was perhaps a bit better than I hoped for. 3:24:56. I averaged 17.0mph for the first lap and 16.7mph for the second lap. Although it’s not a closed road event, most of the route is on quiet country lanes, and you go through a few nice little villages. The run was 3 laps of 7k. Each lap started with a 1k out-and-back section through the trees by the side of the lake and then there was a 6k out-and-back section on the road. It was great to be running with lots of other people and to be able to spot and say hi to people I knew. Run lap 1 went well. I averaged 8:57/mile, which included a brief walk through a water station and also nipping behind a hedge for a quick wee (!). The wheels started falling off after that though, having to resort to more and longer walk breaks than I would have liked. Lap 2 was 10:53/mile average and lap 3 was 10:41/mile average [I did manage to pick up the pace a little bit in the last couple of k when I could feel that the end was finally in sight]. Total time for the run was 2:17:19. I think there were 2 main reasons for my problems on the run. 1) I hadn’t done enough run training! (schoolboy error — I would have done more for a standalone half marathon!!). 2) I was relying on what I was expecting to be provided at the drink/feed stations on the run, in particular energy drink, coke and water. The organisers had clearly underestimated demand because by half way through my run there seemed to be no more energy drink [if indeed it was energy drink?] or coke to be had, and I heard they had even run out of water at one station on my last lap, although fortunately they had received extra supplies by the time I got there. Ralph in his non-regulation trisuit, but with fierce calf game. I guess the lesson learnt there is “be as self-sufficient as you can and don’t rely on what you think/hope is going to be available at feed stations — if there’s anything you want/like/need there then that’s a bonus!”. So, I’d done it — box ticked and I felt chuffed! First problem was that when trying to bend down to pick up my stuff in transition the front of both knees really really hurt! Then when I got my bike and all my stuff back to the car I felt really really sick! Fortunately I managed not to be. 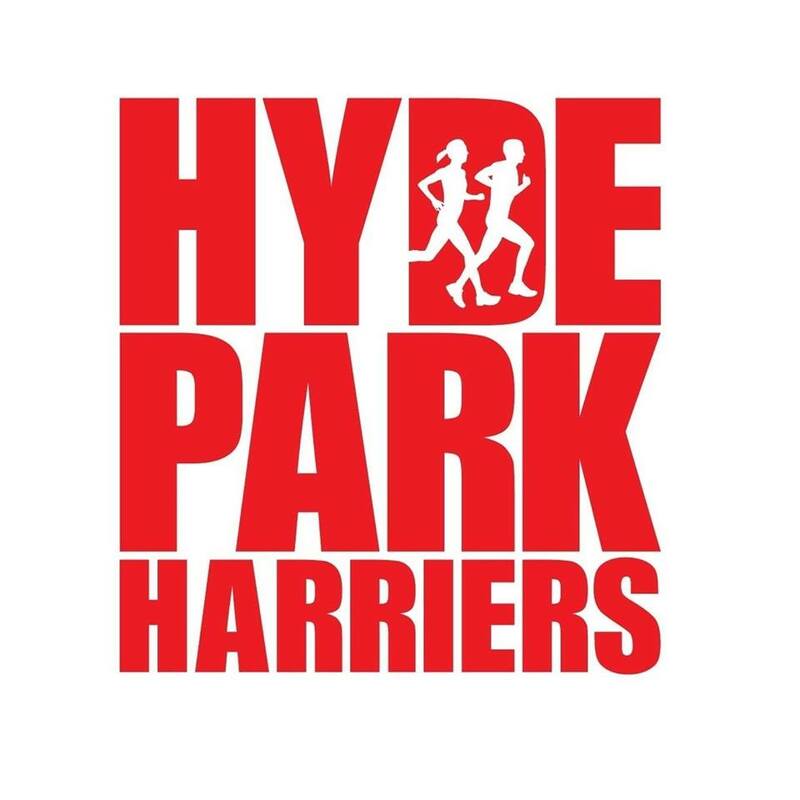 Anyway, to sum up, it was (for the most part) a well-organised and well-run event, which I enjoyed doing, and I would recommend to anyone wanting to step up to middle distance or anyone looking for a pb at that distance. And it was a nice medal and t-shirt I got for finishing ;-). Now I know we’re a tri club, but cycling is perhaps the most under-represented part of the club — I know it’s my own weakest area! And sportives are great ways to get some quality miles in the legs, normally with interesting, well-signposted routes, and plenty of other cyclists to lock in behind for that added aero bonus. So while some of us were out swim-bike-running, resident lycra expert Farhad was putting in a big turn in the saddle in what turned out to be a very eventful day! I was looking forward to doing this event in 2–3 different ways! 1- I felt alright about myself as I had some good preparation and training done in the build up to it. 2- at first there were a few friends from BMCC who I first met in the very same event from the year before who said that they’ll be riding the event with me which I was very excited about to see how far and better I’ve come and become as they were stronger when I first met them. But unfortunately that didn’t go to plan and at the end they didn’t ride the event! 3- the weather, the “making it great or so less great” factor in cycling world! It meant to be a nice, dry and sunny day with a little bit of wind in early morning and getting stronger and stronger as the day goes on. Those were the kind of things that I was looking forward to but things always can change and sometimes they do change to better and sometimes the opposite. It’s the day and what can happen? Due to lack of sleep the night before I was little bit late on my arrival so I had already missed starting with all the potential fast riders who were riding the long route to form a group and ride together so I started my ride with the riders who were doing the medium route. That itself made it a fraction more difficult as I had to weave through waves of riders to get to the front. Nevertheless, I felt great seeing I was doing 22 plus mph till near half way before the wind was starting to get stronger and starting to slow me down. I pushed on. I skipped the first feed station and actually had a plan to do it all non-stop but the warmer temperatures and strong winds meant working a lot harder than I needed to, which means more liquid needed. Forget about food, I had some good and stuffed with Brazil nuts dates with me and could eat while riding. By mile 60 just before the second feed station I was running out of drinks so I thought I’ll stop for a quick refill of my bottles, as I stopped and come off my bike I had pain under my right foot. What pain! A pain that I’ve never experienced before, a very unbearable pain, can’t describe how bad it was honestly, everyone noticed it straight away, sat on the floor in pain! Well, I’m in pain and I’m desperate to finish this ride! They asked me what I wanted to do and if I wanted to wait for the sweeping bus to come and get me after everyone had finished?! No way I said, I said just help me reach my bike and I want to finish this ride. I had to leave the bike on the tarmac as the car park where the feed station was had new thickly resurfaced with gravels so impossible to ride and impossible to walk on, anyhow a friend helped me back lending me his shoulder to my bike and I jumped back on (I didn’t jump back on, I somehow got back on it) and started riding again. It wasn’t as much fun from here but I was very determined to finish it and I’ve got to say I was very pleased to have finished the ride and come away with a great time of finishing the 102 miles in just over 5 hours and achieving 20mph average pace which was my number one target. Knowing I did that solo with that pain, makes me even happier and feeling stronger about myself. So I definitely want to do it again! The event itself was ok, the organisation was ok, the sign posts were ok, I was little bit disappointed about how quieter around the start and finish line was compared to the previous year where there was a music band a a much bigger crowd! This is just my personal experience, it might’ve been completely different in someone else’s eyes. Technically, that Sunday was meant to be my final long run ahead of my fast-approaching marathon. But when a Fulham friend asked if I’d do a triathlon with her before she moves to Canada, I couldn’t really say no! Uckfield is somewhere in the south. I’m not really sure where, primarily because I was asleep in the car the whole way there! After all, it was a 7:30 start, meaning the alarms were set for 5am! The race consisted of 600m in a pool, 22km on the bike and 5km on foot. Great for a super-speedy dash around! Helen rocking the Fulham Running Club stripes. Me rocking the “I woke up at 5am” shades. We’re running our second GO TRI event on 22nd SEPT 11:30 til 2ish. If anyone is free to help out on the day could you please let Julie Robson know. We will also need the HPH cake baking heroes too. I think the event might be full, which is fantastic news! The finals are happening down in Australia this weekend. So tune in to see our local heroes Vicky Holland, Georgia Taylor-Brown and Jess Learmonth (along with a couple of lads from Bramhope) racing for the chance to be crowned world champion! Sometimes you see something that makes complete sense. As has already been mentioned, I’m not a great cyclist. I often find my legs get tired waaaaaaaay before my heart and lungs do. And from other runners I’ve spoken to, that’s often the biggest problem when moving across to triathlon. So this article from 220 magazine has given me some great ideas for winter training sessions!